Malaria-free and within a two-hour drive of Johannesburg Pilanesberg offers great conference venues and makes the African safari experience easy and accessible. Big Five game viewing and a wide range of activities and accommodation options make Pilanesberg National Park the ideal venue for conferences, functions, team-building and weddings. The lodges offer state-of-the-art facilities and a wide range of accommodation in one of South Africa’s favourite wilderness areas. International conference visitors can land on O.R. Tambo International Airport in Johannesburg, which is South Africa’s major transportation hub. Most international and all local airlines land in Johannesburg. From Johannesburg and Pretoria it is a two-hour drive to Pilanesberg. Fully equipped conference facilities cater for up to 120 delegates and a wide range of recreational facilities make Babukung Bush Lodge the ideal venue for functions and conferences in a pristine wilderness environment. 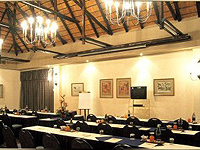 On the slopes of a volcanic outcrop Kwa Maritane offers conference facilities with a splendid with of the Pilanesberg National Park. A wide range of accommodation caters to every taste and budget and the conference facilities cater for up to 264 delegates. 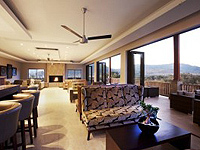 This exclusive lodge in a private concession within the Pilanesberg National Park offers a state-of-the-art conference and functions centre that caters to 70 delegates. Shepherd’s Tree Game Lodge integrates tailor-made conservation experiences and offers incentive activities. 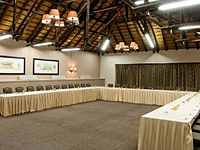 Situated in the heart of Pilanesberg with a wide range of incentives and activities Ivory Tree lodge is an ideal venue for conferences and functions. 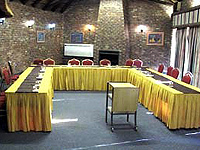 The dedicated conference room is designed for up to 70 delegates. Three different conference rooms with a variety of possible set-ups allow for conferences and functions of any size. 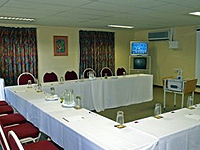 Bakgatla Resort is ideal for seminars, banquets, conventions and product launches, but also offers team building. 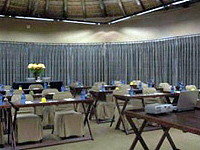 With an auditorium and two conference rooms Manyane Resort is ideal for seminars, conventions and product launches. Team building exercises in the Pilanesberg National Park cater to all ages and levels of skill.